DISCLAIMER: This site is in no way affiliated with Fender Musical Instruments Corporation, CBS Musical Instruments, or any other company. The Fender brand names and logos are trademarks of their respective owners, and are not specifically endorsed by the owner of this website. We are faithful to Leo's original ideas building amps with hands of people, not machines. We are in no way, even remotely related to any products sold by FMIC. 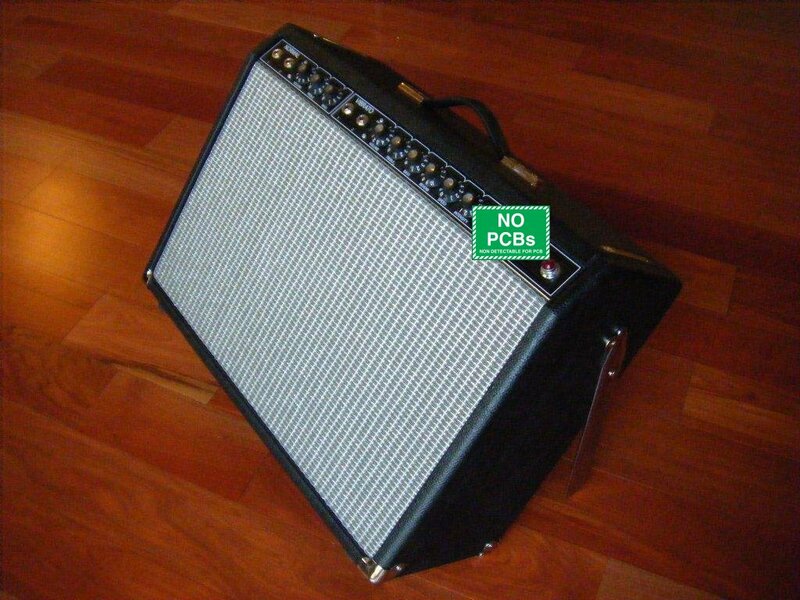 At the request of FMIC, I have renamed the specific models of Deluxe, Vibrolux, Princeton, Vibro Champ, Bassman, Vibroverb and Twin. As each is built, photos of amps will be posted with new logos. Vibrolux is first up. Tube-Tone Amplifiers are re-creations of the 50s~60's amplifier designs of George Fullerton, who basically designed the Fender amplifier designs for the company started by "Doc" Kauffman and Leo Fender using the same construction methods used by Leo and Doc, prior to Leo selling the Fender Musical Instrument company to CBS in 1965. The tried and true designs used by Fender were those of George Fullerton which we faithfully copy. We use the Weber AlNiCo and ceramic speakers considered as the best replacement speaker for 60's amplifiers for that ultimate vintage tone, ordered pre-broken in on a variac. Modern amplifiers (including many re-issue models) made today use printed circuit board technology with thin signal traces and inferior components. Jacks, switches, tiny pots, and sometimes even tube sockets are attached to the board only by the solder, yet they are bolted to the chassis, almost designed to fail from the built-in fatigue on solder joints. These components fail over time from extreme temperature changes and general use. All our amplifiers are hand soldered using cloth covered solid core wire and RoHC compliant (lead free) silver solder. All use quality components such as JJ power and preamp tubes, F&T and Sprague electrolytic caps, Mallory 150 tone caps, Switchcraft jacks, Alpha and CTS potentiometers, Carling switches, and finger-jointed pine cabinets. We also use the Weber AlNiCo and ceramic speakers considered as the best replacement speaker for 60's amplifiers for that ultimate vintage tone, ordered pre-broken in on a variac. 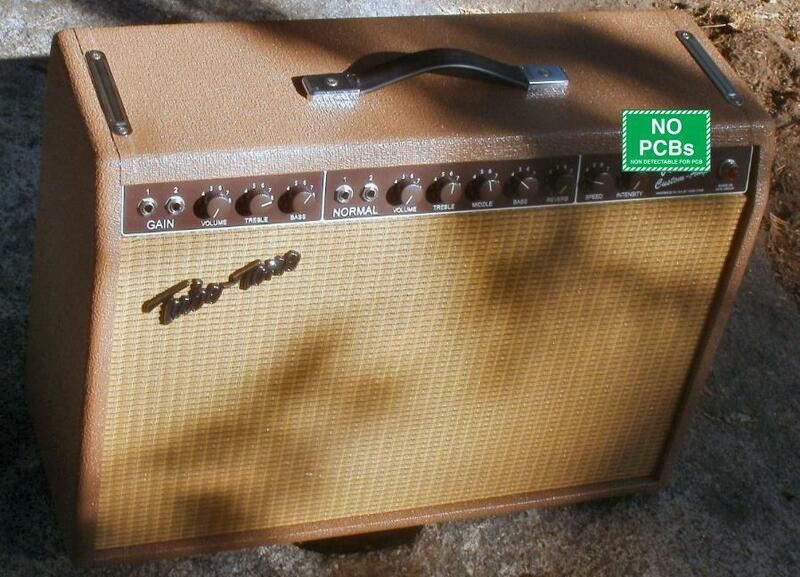 All transformers are Magnetic Components "Classic Tone" or Heyboer. For the Mercury Magnetics lovers, we are now a dealer of the full line of MM Toneclone and Fatstack transformers at extra cost. All components are RoHS compliant for the new international sales requirements. We carefully follow Leo's example of lead dress for the best signal-to-noise ratio which gives the quietest idle hum. We follow Leo's schematics to the letter, with a few additions that make absolutely no difference in the tone of the amplifier. If Leo was around today, he would have done the same such as adding a line/record out jack. In the 60's, it was unheard of to send a line out to the PA system. Back then if more volume was needed, they simply added more amplifiers in a stack. Another innovation we use is a separate bias adjustment pot for each power tube. In the 60's, tubes were made with tight tolerances for high quality tubes that all had about the same power output. Today's tubes can vary considerably in plate current. Power tubes need to be ordered in matched sets for optimal bias voltage adjustments. With our innovation using a bias pot for each tube, you never need to pay extra for a matched set of tubes again. When power tubes are changed, the tech simply replaces the tubes and adjusts the bias voltage for each tube separately, for exact matching of output current yielding the optimal power and life from the power tubes. 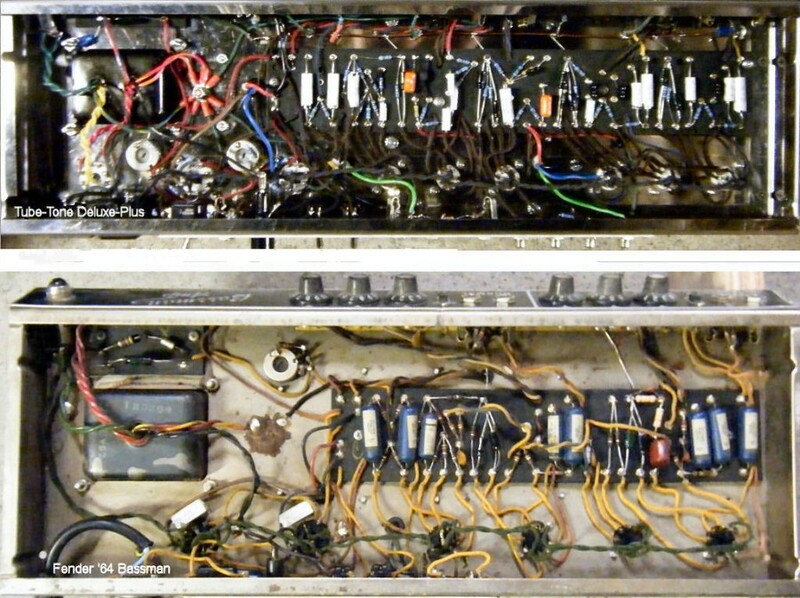 Below are photos showing a Tube-Tone Deluxe-Plus chassis and an untouched (other than replaced caps) 1964 Fender Bassman chassis. This is to show how close we follow the 60's Fender lead dress. Fender used a brass plate for the grounds but using a buss gets each preamp ground close to it's cathode ground, and isn't dependent on the brass plate not corroding or having tight nuts on every pot. We've recently changed grounding scheme from Fender's, using a buss bar rather than the brass plate, but still keep separate grounds for power and preamp filters for a wisper quiet operation. 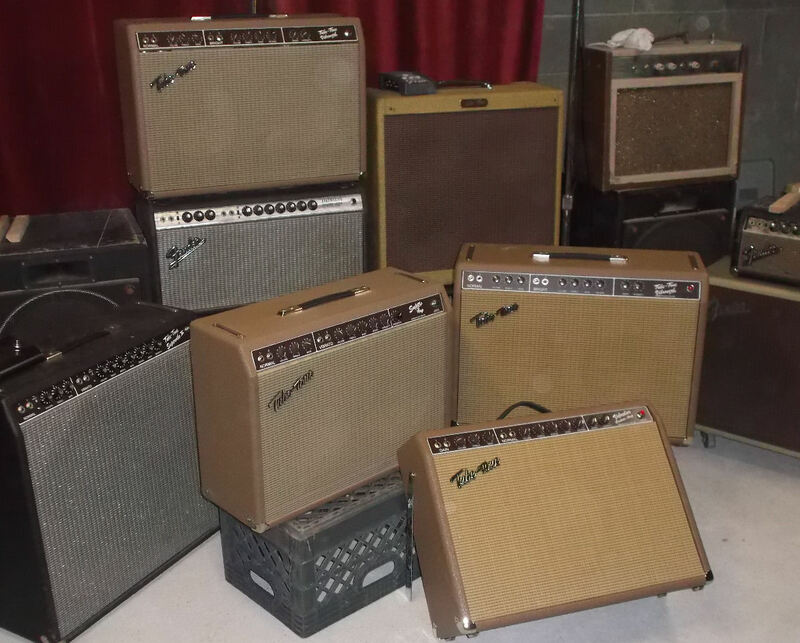 We manufacture all the popular Fender blackface, brown and tweed amps including the '59 Bassman, Twin-Reverb, Super-Reverb, Vibrolux-Reverb and Deluxe-Reverb. 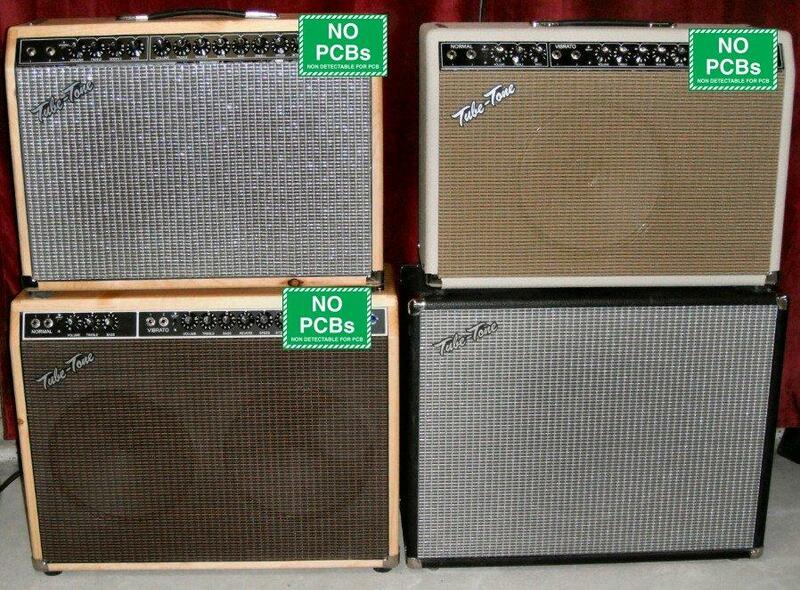 Of these, our favorite is the "Deluxe", patterned after the blackface Fender Deluxe-Reverb AB763 circuit from '63-'67. Small and compact with single 12" speaker, yet loud enough to cut through animal drummers and monster bass players in gigs where the amps are not miked. We now have discounted rates with FedEx for international shipping. Contact us for a quote to all other countries. Most amps require a 50% deposit on ordering. Build time depends on order load. 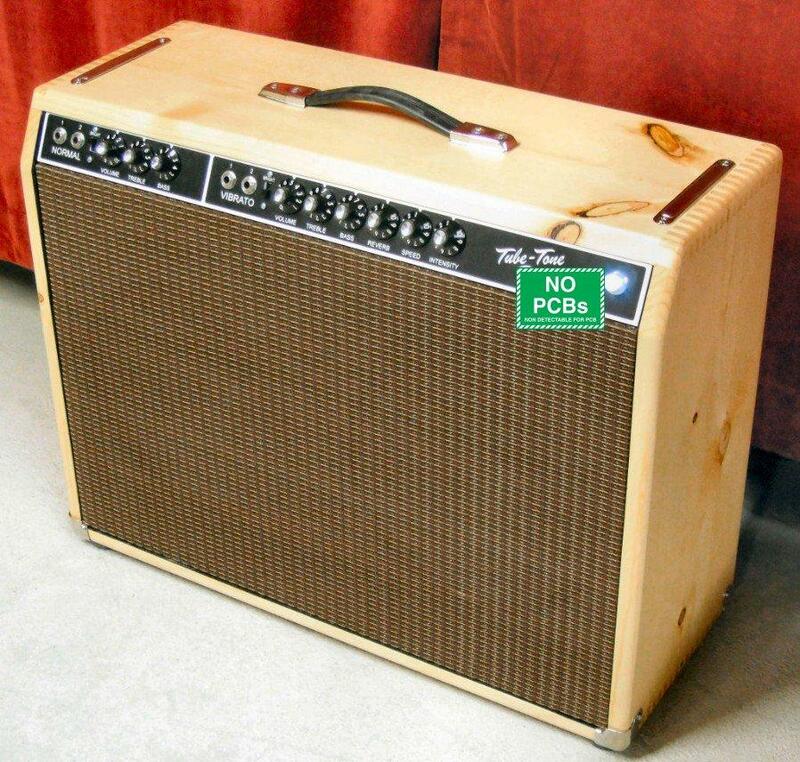 Current built time is 4-6 weeks from order until the amp is ready to ship. If requested, amp will be gig-tested before shipping. Custom ordering can include mods such as bias modulating tremolo (not LDR), extra gain stage, G-10 glass epoxy eyelet board, bias adjusting jacks, preamp out/power in jacks, switchable solid state/tube rectifier, Pentode/Triode switch, channel switching pedal, different speakers, as well as different coverings. Contact us for any special orders. Lacquer finished pine cabinets are available on all models, $100-$150 extra charge. All covering options on "Coverings" page are no additional charge except the "aged tweed" is + $30. Below are some YouTube videos of Tube-Tone Amplifiers.